Image caption Rihanna stood to greet Prince Harry, who said: "Hello, it's very nice to meet you." 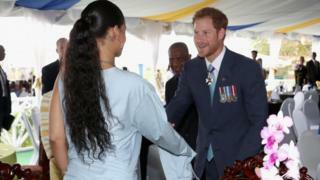 Prince Harry has met Barbados's biggest star, Rihanna, twice in a day at events marking 50 years of independence. Rihanna, who has had eight UK number ones and 29 UK top 10 hits, stood to greet the prince, who said: "Hello, it's very nice to meet you." "We thought he would be meeting her for the first time at the concert," he said. Rihanna wore a blue dress and opted for striking yellow finger nails - both colours are on the Barbados flag. The extraordinary talents of your people, from the cricket field to the music industry have been admired and recognised throughout the world. Barbados remains a favoured holiday destination for British people, not only for the incredible natural beauty of your country but because you have a great warmth and generosity of spirit. Prince Harry told the audience: "Your independence was a declaration of confidence in the future. Barbados independence 50: What changed after the British left?